Figure 1. An SMS gateway acts as a relay between two SMS centers. Figure 2. 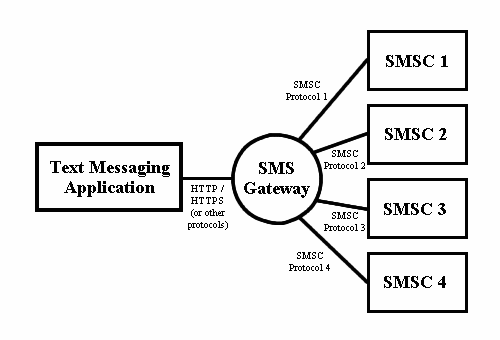 An SMS text messaging application connects to SMSCs without an SMS gateway. 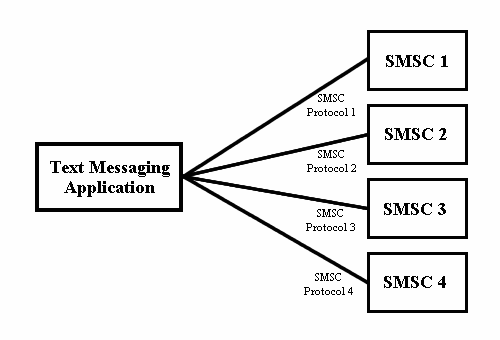 To connect to an SMS gateway, you can use an SMSC protocol such as SMPP and CIMD. Some SMS gateways support an HTTP / HTTPS interface. HTTP / HTTPS is easier to use than SMSC protocols. The drawback is that there may be fewer SMS features to use. For example, an SMS gateway may not support the sending of picture messages through the HTTP / HTTPS interface. Figure 3. 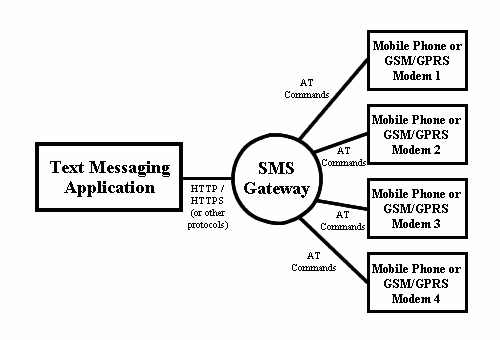 An SMS text messaging application connects to SMSCs through an SMS gateway. Besides using a direct connection to the SMSC of a wireless carrier, another way to send and receive SMS text messages on a computer is to use a mobile phone or GSM/GPRS modem. To do this, your SMS text messaging application has to know how to communicate with the mobile phone or GSM/GPRS modem using AT commands. Some SMS gateways are capable of handling the connections to mobile phones and GSM/GPRS modems. To send and receive SMS text messages with a mobile phone or GSM/GPRS modem, the SMS text messaging application only needs to know how to talk to the SMS gateway and does not need to know anything about AT commands. More details about GSM/GPRS modems and AT commands will be provided in later sections of this SMS tutorial. Figure 4. 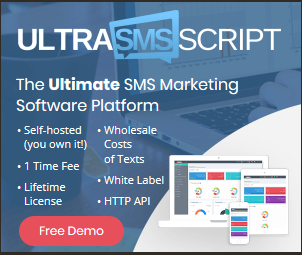 An SMS text messaging application connects to a pool of mobile phones or GSM/GPRS modems through an SMS gateway. As you can see in the above sections, an SMS gateway has a lot of responsibilities in an SMS messaging system. So, SMS gateway software can be very complex and complex software is usually expensive. Fortunately, there are open source SMS gateway software packages that can be downloaded free of charge over the web. One high-quality free SMS gateway software package is Kannel, which is written in the C programming language. Kannel can handle connections to SMSCs, mobile phones and GSM/GPRS modems. It has an HTTP / HTTPS interface for the sending and receiving of SMS messages. More information about Kannel can be found on its web site http://www.kannel.org/.